When Titan Production planned a “mini frack” on the border of Colleyville and Southlake, Colleyville hired a consultant to monitor Titan’s activities. Residents decided to do their own testing. It is difficult to get a firm grip on the consultant’s findings in his Report to Colleyville because it’s slippery. There are conflicts in what he says he found and in what he also says he found. There are some things to remember about the consultant’s (Tramm) report. Page one of his report starts with a letter to the city in which he bullets his findings and recommendations. AVO Observations did not indicate spills, leaks or releases near wells or associated frac tanks and flowback lines. AVO = audio, visual and olfactory. Near-Equipment Monitoring identified significant methane emissions (up to 20% by volume) from the flowback water throughout flowback event. Low levels of VOC’s (less then 8 ppmv) were noted within the flowback emissions. Strong humic odors were noted at the frac tanks with lessening odors noted in areas with methane observed above 2 ppmv. The open tank hatches were the primary point of methane emissions. The two bullet points conflict. The third bullet point lists the chemicals detected in his testing, many of which were detected by the residents. The forth bullet point recommends “improved capture and removal of methane and associated VOC emissions during future events.” He goes on to recommend vapor recovery units. Clearly there were emissions into the air during this fracking and flowback event which is a violation of the Colleyville Drilling Ordinance. Page 17, item c states: No person shall allow, cause or permit gases to be vented into the atmosphere or to be burned by open flame. No open flaring is permitted. Green completion methods as defined in this chapter are recommended during the hydraulic fracturing, flowback and well completion process. A green completion plan shall be submitted in conjunction with the required SUP application. In an email to Colleyville residents from the city prior to the “mini frack”, they indicate the operations will cease if gas is detected. Gas was detected but ignored and operations continued. – No venting or open flaring of gas is permitted at any time. Titan will not be flaring or venting any of the wells as part of the fracturing. The company will immediately shut off the wells if any gas is detected as part of the fluid flowback process. Air quality will be continuously monitored during fracturing to ensure compliance with all city, state, and federal regulations. If you decide to read Tramm’s report, pay close attention to the list of chemicals on the bottom of page 19 and top of page 20. Remember to convert to ppm to ppb you multiply by 1000. Again, emissions were detected at high levels and it is beyond logic to believe those emissions did not cross the fence line and travel out into the community. Here is a picture from Tramm’s report. 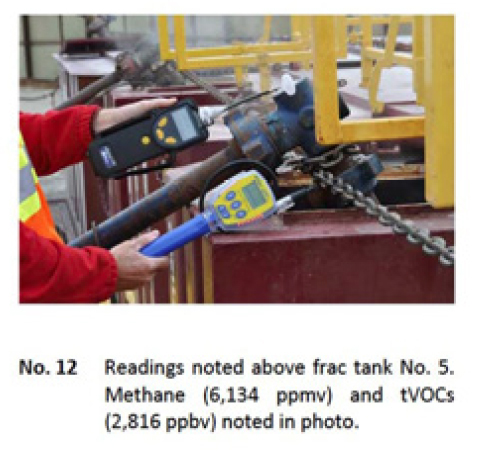 Throughout Tramm’s report, he uses ppmv so it is not clear why he switched to ppbv in the photo above to note the VOCs detected. Typo is my best guess. Again, multiply by 1000 to convert to ppbv. Those readings are extremely high. After the community testing results, Tramm issued a new report where he tries to discredit the results of the community testing. (Please note that contrary to claims made, the community testing was not conducted by Earthworks or Wilma Subra. It was a grassroots action taken in an effort to protect their community in the face of the failures of the TCEQ.) Tramm makes his living as a consultant or “environmental advisor” so it is in his financial interest to discredit any other source of testing. Deploying a SUMMA canister is not rocket science. That is why the TCEQ often leaves them with residents who make frequent complaints. The residents deploy the canisters, which requires turning a knob to open a valve and then close that valve after the appropriate time period, sign an affidavit and call the TCEQ to pick up the canister for lab analysis. Tramm also tries to discredit the lab that analyzed the canister results. GD Air is TCEQ and EPA certified. When Tramm claimed that the carbon disulfide results were only estimates, GE Air responded. Sharon, this email is an attempt to clarify the discussion over carbon disulfide and the certification process. EPA Method TO-15 is a procedure to analyze for 97 volatile organic compounds (VOCs) that are part of the list of compounds from the Clean Air Act Amendments of 1990. From the laboratory standpoint, many of these compounds are NOT commercially available for testing. The manufacturers that we buy our standards from have 65 of these VOCs. One of the VOCs that IS available is carbon disulfide (CS2). In order to be accredited by TCEQ, a laboratory must successfully demonstrate several steps for each method, including a calibration, a first and second source for the standards, demonstrations of capability, and detection limit studies to show how low the instrument can theoretically “see” a given VOC. In this case, GD Air Testing complies with all of these requirements with respect to CS2. The problem with accreditation from TCEQ for CS2 comes from the list of possible VOCs that TCEQ recognizes with respect to TO-15. TCEQ does not use the list of 97 VOCs mentioned in TO-15. While many of the compounds are directly from TO-15, there are quite a few that are not found in TO-15. Conversely, many of the compounds that are part of TO-15 are NOT part of the TCEQ accreditation program. One of these VOCs is CS2. In summary, from a laboratory standpoint, TCEQ does not recognize any method for the testing of CS2, while EPA Method TO-15 does recognize CS2 as a valid VOC for testing. If you have any other questions, please feel free to call or email. So, what was industry’s response to all this air testing that obviously shows there are problems? They did what they always do: throw a bunch of money at it hoping to make it go away. No one in Southlake can find any information on Doug. Maybe Chad* knows Doug. *Chad Davis is featured in an industry TV commercial and claims he does fracking in Celina, Texas. There is no fracking in Celina. Here’s my blog post about that and The FW Weekly Static. UPDATE: Doug has been found. He works for Titan Engineering, a consulting firm that, among other things, helps industry cook their numbers so they can meet the permit by rule process. For over 10 years, TITAN has served the Oil & Gas Industry’s environmental and engineering consulting needs including air permitting, property due diligence, and complex remedial system design and implementation, among others. Our qualified staff, corporate commitment to exceptional service, and real industry experience enables TITAN to consistently deliver superior services that meet our clients’ needs. TITAN understands the environmental challenges of the Oil & Gas market extending through the entire collection and production process. Whether a project involves property transfer and liability risk evaluations, compliance or environmental management compliance program support, product release investigations, or design and implementation of remedial measures, TITAN has the resources, experience and commitment to meet our clients’ goal while protecting the environment. Another update: Doug was on during American Idol tonight. That must have cost quite a bit. And yet another update: I’m just going to come right out and say it: Doug is a big liar! A commenter reminded me that Titan Engineering is the company that did air testing in Forth Worth for industry. They have found plenty to be concerned about which is probably why Doug lives a mile away from the pad site now the 1/4 mile he claims. But THEY HID THE RESULTS. Doug says he lives a 1/4 mile from the site, but the truth is that he lives almost a mile away. Hard to believe people when they can’t tell a simple truth like that. Maybe you could share Dougy’s last name so we can look on Google Earth exactly where he is in relation to gas operations. I’ll have a map up later. Curious why Doug is toting around a Summa canister in the commercial when residents who used the same equipment were criticized for using that exact testing method?? This is just a guess but maybe the inability to accurately calculate distance is a requirement for deploying a SUMMA? Nah. I know several people who have used SUMMAs successfully and they can calculate distance fairly accurately. I think Doug is blinded by his pocketbook. Isn’t Titan the same company that did testing in Ft Worth and actually did find exceedences, and Fast Eddie conveniently missed that part in his talking about the testing results? Maybe I’m wrong, these frackers all start to look the same after awhile.